US military, however, denies pullout of 50 percent of its forces will begin this month as Taliban envoy said. ATalibanofficial said on Wednesday theUnited Stateshad promised to withdraw half of its troops fromAfghanistanby the end of April, but the US military said no timeframe had been set. ButPentagonspokesman Army Colonel Rob Manning said the US military had received no orders to begin withdrawing. A US military spokeswoman in Kabul also denied an immediate troop withdrawal. 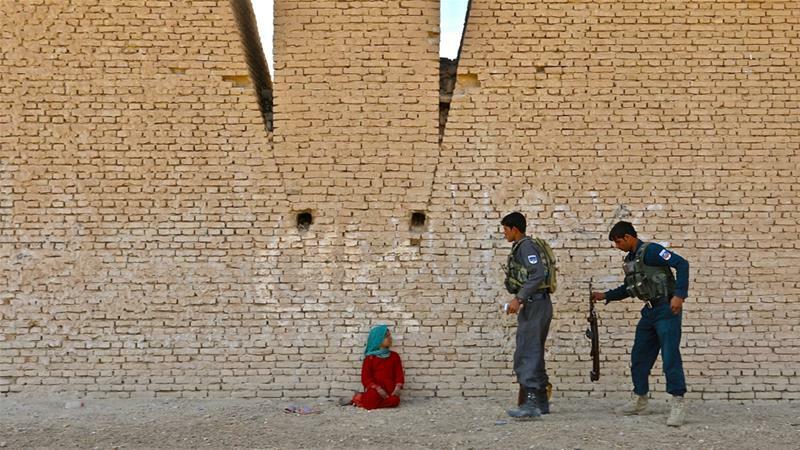 "If all parties do what is necessary to prevent Afghanistan from being used as a platform for terrorism, as conditions allow we are willing to look at changes in force presence," she told the AFP news agency. Hanafi said Washington and the Taliban agreed that all foreign troops would eventually leave and Afghanistan would never be used as a base for attacks on the US. He added the US and the Taliban will each create a technical committee that "will work on a timetable for the withdrawal of remaining troops". The Taliban entered the second day of unprecedented talks with powerful Afghan politicians in Moscow on Wednesday, sidestepping the Kabul government. No government official was present in the meetings. Stanikzai made a rare appearance in front of international media alongside former president Hamid Karzai after the talks wrapped up. Karzai called the discussions"very satisfactory". The Moscow summit took place a week after the Taliban held separate talks aimed at ending 17 years of fighting with American negotiators in Qatar. Afghan PresidentAshraf Ghaniwas also not invited to the table in Doha. "The Moscow meeting is nothing more than a fantasy. No one can decide without the consent of the Afghan people," Ghani told Afghan broadcaster TOLOnews. "Those who have gathered in Moscow have no executive authority. They can say what they want, but who are they representing?" The Moscow conference is the Taliban's most significant engagement with Afghan leaders in recent memory. US secretary of state says the US will not cede leadership of the fight against ISIL despite troop withdrawal. US Secretary of State Mike Pompeo on Wednesday reassured coalition partners that the withdrawal of US troops from Syria was not "the end of America's fight" and called on them to help permanently defeat the Islamic State of Iraq and the Levant (ISIL, also known as ISIS) inSyriaandIraq. "The US troops withdrawing from Syria is not the end of America's fight. The fight is one we will continue to wage alongside you," Pompeo said, addressing foreign ministers and other senior officials from 79 countries that have worked alongside theUnited Statesin fighting the armed group in Syria and Iraq. Despite US President Donald Trump declaring "mission accomplished" in December, Pompeo said the troop withdrawal was "essentially a tactical change ... not a change in the mission". "It simply represents a new stage in an old fight," Pompeo said, adding that although progress has been made in defeating ISIL, the group remained a dangerous threat. The conference started hours after Trump, in his State of the Union address, lauded what he said was the near-complete victory over ISIL. He also reaffirmed his determination topull out roughly 2,000 US troops from Syria. He had said in December that the pullout would proceed quickly. 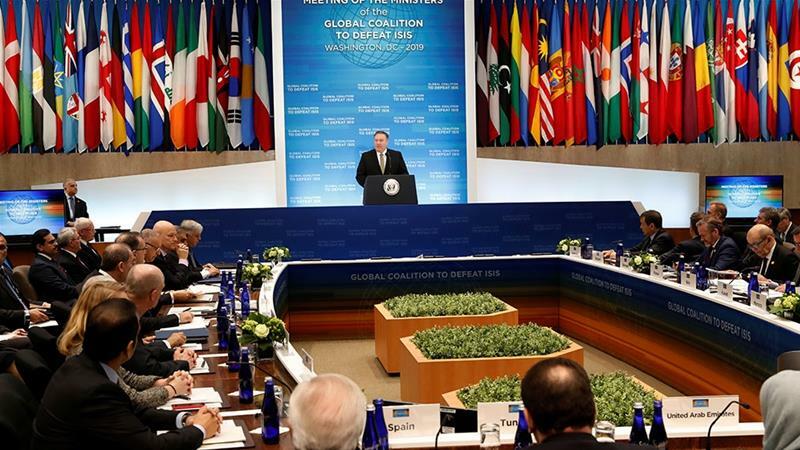 Addressing Wednesday's gathering of foreign ministers, the US president said he expected a formal announcement as early as next week that the coalition fighting ISIL had reclaimed all of the territory previously held by the armed group. He said he wanted to wait for the official word before making any announcement. "I don't want to say it too early," he told the gathering. Trump's surprise end-of-the-year announcement about the troop withdrawal prompted the resignation ofDefense Secretary James Mattisand the early departure of the top US envoy in the anti-ISIL fight, Brett McGurk. The president also received pushback fromUS military leaders who argue that ISIL remains a threat and could regroup after the US leaves. Even as Pompeo spoke on Wednesday, a senior military official acknowledged to politicians that with the pullout,"it is going to be difficult to keep up the pressure". Major General James Hecker, the vice director of operations for the Joint Chiefs of Staff, told the House Armed Services Committee that"there will be a decrease in the amount of pressure that we will be able to apply". Hecker said others would have to carry the burden once the US left. He said that the US "mission is unwavering, but we need your help to accomplish it, just as we've had over the past months and years". Pompeo said, "To that end, we ask that our coalition partners seriously and rapidly consider requests that will enable our efforts to continue. Those requests are likely to come very soon." He did not elaborate. Iraqi Foreign Minister Mohamed al-Hakim, speaking after Pompeo, called on countries to help expose ISIL "sleeper cells" in Iraq and restore stability. However, Iraqi President Barham Salih said on Monday that Trump did not ask Iraq's permission for US troops stationed there to "watch Iran". The US and Iran are Iraq's two biggest allies. 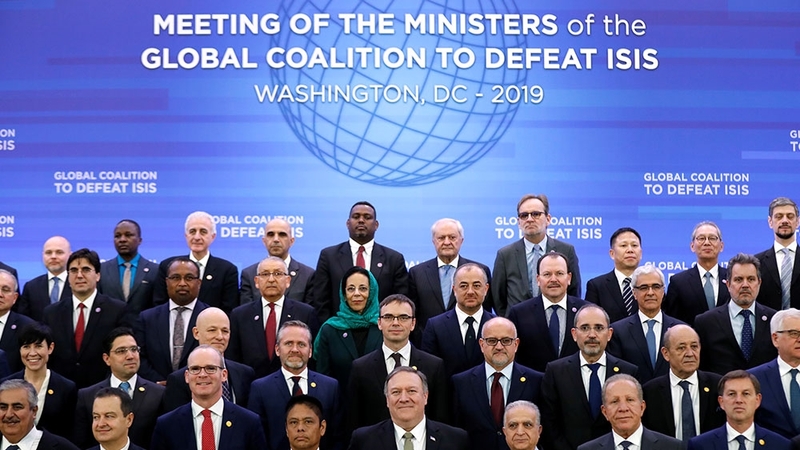 The 79-member Global Coalition to Defeat ISIS was formed in 2014 and works to reduce the threat the armed group poses to international security and US homelands. Since 2014, coalition members have provided more than $20bn support in Iraq and Syria. To date, partners have pledged more than $1bn in stabilisation programming in Iraq and $300mn for stabilisation assistance in northeast Syria, according to the US Department of State. Trump is scheduled to address the coalition at 20:00GMT. Madaxweyne Ku-xigeenka Dalka Afghanistan Oo Iskuday Dil Ka Badbaaday.